Spain will do “everything within the law” to prevent Catalonia from declaring independence, Justice Minister Rafael Catala said Monday, a day after Catalonia’s regional government declared victory in a banned secession referendum. Catalonia “If anyone plans to declare the independence of part of the territory of Spain, as he can’t since he does not have the power to do so, we would have to do everything within the law to impede this,” he said in an interview with Spanish public television. Catalan president Carles Puigdemont declared late on Sunday that Catalonia had won the right to break away from Spain after 90 percent of voters taking part in the referendum voted for independence, defying a sometimes violent police crackdown and fierce opposition from Madrid. He said he would now present the results to the region’s parliament, which then had the power to adopt a motion of independence. Pro-separatist lawmakers have a narrow majority of 72 seats in the 135-seat Catalan parliament. 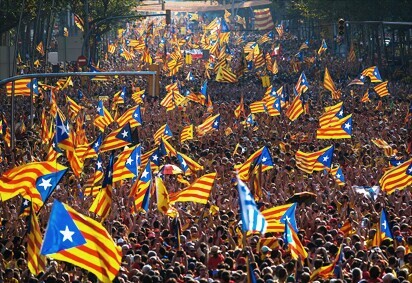 Asked if the central government would use Article 155 of the Spanish constitution, which would allow it to practically suspend the autonomous powers of the northeastern region, Catala said: “That is a tool that is there.” “We have always said that we will use all the force of the law, all the mechanisms that the constitution and the laws grant the government,” he added. “We are not here to divide Spaniards, we are here to serve the general interest, therefore if we have to use certain measures that worry us and may hurt, we will do it. It is important to guarantee that Spain has rule of law, that laws are fulfilled,” he said.